5 bed detached villa on large plot - Property for sale. 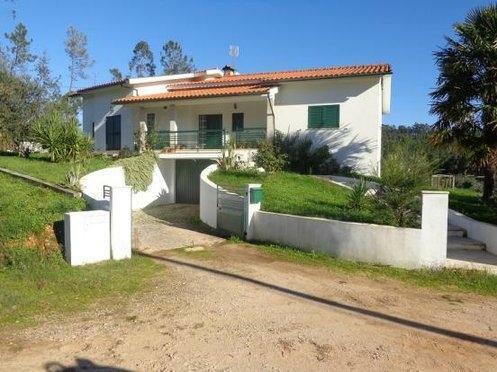 Full Description: Located in a lovely countryside location close to Miranda do Corvo in the Coimbra district of Portugal is this 5 bedroom family home. The property comprises of large lounge with feature fireplace to the front of the property and patio doors opening out onto the front garden. The spacious kitchen/diner is located to the side of the property and has lovely views of the forest. 3 double bedrooms, one of which is en-suite and communal bathroom, which is sited between two of the bedrooms. There are stairs leading down to an enormous integral garage with 2 further bedrooms, kitchen and bathroom. This area could easily be converted into extra living space. This family-sized property is sited in an elevated position with wonderful forest and mountain views in a private position with no neighbours. The flat, arable land has an area of approximately 5000m2. The town of Miranda do Corvo is a 5 minute drive away where you can find all modern-day amenities. The main city of Coimbra is around 30 minutes drive.